A large-scale commodities fair featuring rich and exciting displays from East Asian countries kicked of on Sept 5 at Qingdao World Expo City, a landmark spot located in the Qingdao West Coast New Area. The five-day event was attached to the 2018 East Asia Maritime Cooperation Platform Qingdao Forum. With the participation of 500 exhibitors from 40 countries and regions, the exhibition showcased more than 15,000 kinds of products. 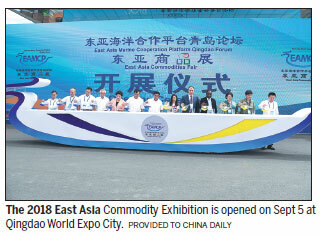 Organized by administrative committee of Qingdao West Coast New Area and Huangdao Development Group, the 2018 East Asia Commodity Exhibition was the first session opened in the newly launched Qingdao World Expo City. The exhibition area, boasting about 40,000 square meters, entertained and informed visitors with such diverse products as marine, trade and cultural commodities in the China Pavilion, the International Pavilion and the East Asian Cultural Experience Area. Visitors also explored the latest high-tech achievements at home and abroad, including high-end products utilizing ocean and space science and technology, artificial intelligence and virtual reality. There were also displays on the intelligent management of the ocean, as well as others that explored the cultural customs and charms of East Asia. At the International Pavilion, a group of multinational companies from ASEAN countries - as well as Japan and South Korea and countries involved in the Belt and Road Initiative - presented their standout products. A large number of leading trading firms also brought to the fair foreign foods, smart furniture, maternal healthcare products, cosmetics and skin care products, handicrafts, marine commodities and other special commodities. At the opening day, Japanese and South Korean cosmetics - and displays featuring Southeast Asian cuisine, Russian ham sausage and handicrafts at the International Pavilion - were hot favorites for visitors. The Thailand Consulate General in Qingdao offered Thai-styled delights to attendees. The head-turning variety of commodities included Kyrgyzstan honey, Armenian pomegranate wine and brandy, Moldovan red wine and Mongolian cashmere clothing as well as Croatian wine, Laos beer, Japanese daily necessities and Australian diary products. In addition to high-tech products and services, the China Pavilion also showcased a collection of special domestic goods made by ancient Chinese brands. Among these were tofu products from Wangzhihe, sesame oil from Cuiruifu and thick broad-bean sauce from Juanchengpai. The East Asian Cultural Experience Area hosted stage performances from Sept 5 to 8, showcasing the charm of Pakistani national dance, Russian magic and Brazilian jujitsu. Mirzan bin Mahathir, a company president from Malaysia, said that the latest event had built on the success of past sessions of the East Asia Maritime Cooperation Platform Qingdao Forum, which had created new opportunities for Qingdao. "We believe that through the forum, we can not only cultivate business cooperation, but also realize the advantages of complementary exchange between China and countries in East Asia and Southeast Asia," Mahathir added. Liu Hui, vice-president of China Railway Group, said the East Asia Maritime Cooperation Platform Qingdao Forum had laid the foundations for business cooperation among ASEAN and East Asian countries in the maritime industry. This was significant in promoting multilateral dialogue between China and ASEAN countries - as well as with Japan and South Korea, Liu added.